We have gathered a wide variety of resources to help you with your practice of mindfulness and to support you on your path to well-being. The guided meditations and handouts can be especially useful in mindfulness-based therapies. These mp3s can be helpful additions to therapies like Acceptance and Commitment Therapy (ACT) and Mindfulness-Based Cognitive Therapy (MBCT). This mp3 presents the fundamental practice of being present and stable. Mindful breathing is helpful in settling the mind. A good introduction to mindfulness. A mainstay of Mindfulness-Based Cognitive Therapy for depression. A short meditation on the breath. Guidance in dropping the self-defeating struggle with anxiety. Helping to develop affect tolerance and willingness to have our feelings. This is a classic image for how to relate to thoughts. A meditation to help you learn a mindful attitude toward thinking. A guided meditation to help change your relationship with your thoughts. A brief meditation in mindfulness of the body. Body scan is an essential practice from Mindfulness-Based Stress Reduction. A guided meditation in loving kindness. Mditation on sounds, body experiences, and loving kindness. Metta is the practice of loving kindness. Mindfulness can enrich our everyday activities. An introductory exercise in mindfulness. A twenty-minute guided mindfulness meditation. A short meditation to help come into the present moment. A simple meditation timer, with bells. A simple guide to meditation in motion. Getting a bigger perspective on your experience. Poetry can express the mindfulness experience with a faithfulness and elegance that transcends any instruction manual! Enjoy these poems we have collected. We hope they inspire your own mindfulness practice. nor this bit of wisdom found by looking. even Gabriel can know by trying to know. This is the presence that doesn't! We have no reason to harbor any mistrust against our world, for it is not against us. If it has terrors, they are our terrors. If it has abysses, these abysses belong to us. If there are dangers, we must try to love them, and only if we could arrange our lives in accordance with the principle that tells us that we must always trust in the difficult, then what now appears to us to be alien will become our most intimate and trusted experience. How could we forget those ancient myths that stand at the beginning of all races-the myths about dragons that at the last moment are transformed into princesses. Perhaps all the dragons in our lives are only princesses waiting for us to act, just once, with beauty and courage. Perhaps everything that frightens us is, in its deepest essence, something helpless that wants our love. So you must not be frightened if a sadness rises before you larger than any you've ever seen, if an anxiety like light and cloud shadows moves over your hands and everything that you do. You must realize that something has happened to you. Life has not forgotten you; that it holds you in its hands and will not let you fall. An image about practicing meditation that may be helpful is that of standing at a railroad crossing, watching a freight train passing by. In each transparent boxcar, there is a thought. We try to look straight ahead into the present, but our attachments draw our attention into the contents of the passing boxcars: we identify with the various thoughts. As we attend to the train, we notice there's supper in one boxcar, but we just ate, so we're not pulled by that one. The laundry list is the next one, so we reflect for a moment on the blue towel hanging on the line to dry, but we wake up quite quickly to the present once again, as the next boxcar has someone in it meditating and we recall what we're doing. A few more boxcars go by with thoughts clearly recognized as thoughts. But, in the next one is a snarling lion chasing someone who looks like us. We stay with that one until it's way down the line to see if it got us. We identify with that one because it "means" something to us. We have an attachment to it. Then we notice we've missed all the other boxcars streaming by in the meantime and we let go of our fascination for the lion and bring our attention straight ahead into the present once again. We stick to some and we don't stick to others. The train is just there - and the silent witness who's standing at the crossroads also seems to be there. Those are the first stages of trying to be mindful, trying to stay in the here, and now. Then, as we're a bit more used to being aware of the contents, we start noticing the process of the train going by-just boxcar after boxcar-and our attention doesn't follow every stimulus: we don't keep getting lost down the track in the past or anticipating what's coming from the future. So, we're looking straight ahead, not distracted by any of the contents, when all of a sudden, one of the boxcars explodes as it goes by. We're drawn out into that one, we jump into the action in that boxcar. Then we come back with a, wry smile full of recognition that it was just an image of an explosion, just a boxcar thought. And, again, we face straight ahead with just the process of passing boxcars, when there we are beating our spouse in one of the boxcars. There's all kinds of stuff in the mind. And we're going to follow it, to be pulled by it, until we start seeing the impersonal, conditioned nature of the contents and recognize the perfect flow of the process itself. Then, we notice as we look straight ahead that we're starting to be able to see between the cars. And we begin to see what's on the other side of the train, what is beyond thought. We experience that the process is occurring against a background of undifferentiated openness, that, moment to moment, mind is arising and passing away in vast space. As we experience the frame of reference in which all this melodrama is occurring, it begins freeing us from being so carried away - even by fear. We start seeing. "Ah, there's the exploding boxcar trick again," or "There's the angry boss one again." Whatever it is, we start seeing it as part of the process. We see it in context. The small mind that identifies with all that stuff starts becoming bigger and bigger and bigger, starts encompassing even itself in a mind so vast it has room for everything and everyone, including the train, and the observer. And, then, even that fellow standing at the crossroads watching turns out to be just the contents of one of those boxcars, just another object of mind. And awareness, standing nowhere, is everywhere at once. These handouts and worksheets can be helpful additions to therapies like Acceptance and Commitment Therapy (ACT) and Mindfulness-Based Cognitive Therapy (MBCT). A brief and surprisingly comprehensive description of mindfulness. Letting go" is a fundamental skill in all therapies. This is a fundamental practice of being present and stable. This is an essential feature of ACT. Useful in ACT, this is one of several aids that will help to clarify your values. The FFMQ is one of the most comprehensive instruments to measure trait mindfulness. The precursor to the FFMQ, it is still used in mindfulness research. A classic self-report measure that investigates our lapses in mindfulness. A helpful worksheet for MBSR, MBCT, and anyone interested in developing a regular meditation practice. Helpful in our Mindful Eating classes. To record pleasant experiences in MBCT and MBSR. To record stressful experiences in MBCT and MBSR. A worksheet to help you remember to be mindful throughout your every day life experiences. Thomson, Roger. (2011). A Workbook to Teach Mindfulness to Teachers? PsycCRITIQUES Contemporary Psychology: APA Review of Books. A review of Psychology Moment by Moment: A Guide to Enhancing Your Clinical Practice With Mindfulness and Meditationby Elise E. Labbé (Oakland, CA: New Harbinger, 2011). Thomson, Roger. (2010). Buddhism on the Couch. PsycCRITIQUES Contemporary Psychology: APA Review of Books. A review of The Zen Impulse and the Psychoanalytic Encounter by Paul C. Cooper (New York: Routledge, 2010). Thomson, Roger. (2010). Buddhist Psychology: The Mind That Mindfulness Discloses. PsycCRITIQUES Contemporary Psychology: APA Review of Books. A review of Unlimiting Mind: The Radically Experiential Psychology of Buddhism by Andrew Olendzki (Boston, MA: Wisdom Publications, 2010). Bly, Terri; Hammond, Megrette; Thomson, Roger; and Bagdade, Paul. (2007). Exploring the Use of Mindful Eating Training in the Bariatric Population. Bariatric Times, November/December 2007, 15-17. A discussion of mindful eating in relation to bariatric surgery. Thomson, Roger F. (2000). Zazen and psychotherapeutic presence. American Journal of Psychotherapy, 54, 531-548. Zen meditation, or zazen, has attracted the interest of many psychotherapists. The teachings and practices of the Soto Zen tradition are understood as encouraging important areas of both psychological and spiritual development. Zen, like the relational psychoanalytic theories, encourages its practitioners to become aware of the fundamentally distorted aspects of an overly individualistic view of human experience. As a spiritual practice, zazen increases the practitioner’s tolerance of the Wholeness that Buddhists refer to as Emptiness. As a psychological practice, it helps us to be more flexibly and intimately present with our patients. An effective therapeutic process, even of the most secular type, will often contain elements of the meditative process of zazen, and failure to actualize this in psychotherapy can have a negative impact on our ability to understand and help our patients. Kwok, Yenni (2005). “Head Space” (an interview with Roger Thomson). South China Morning Post, July 15, 2005. Barbour, Cary (2001). “The Science of Meditation” (an interview with Roger Thomson). Psychology Today, May/June 2001. Padilla, Anjannette (2010). Mindfulness in therapeutic presence: How mindfulness of therapist impacts treatment outcome. Ann Arbor: ProQuest Dissertations. Kabat-Zinn, Jon (1994). Wherever You Go, There You Are. Hyperion (New York). If you would like to read more about mindfulness practice, we highly recommend Jon Kabat-Zinn's book, Wherever You Go, There You Are. Tribole, Evelyn, and Resch, Elyse (2003). 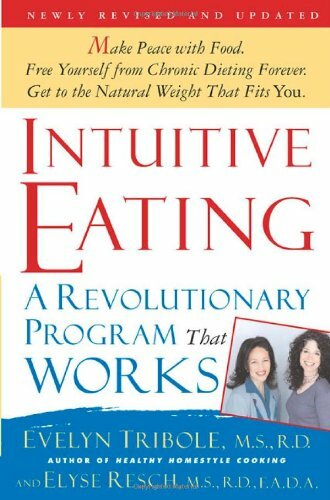 Intuitive Eating: A Revolutionary Program That Works. St. Martin's Press (New York). An excellent and sensible approach to eating that does not rely on dieting. Albers, Susan (2003). Eating Mindfully. New Harbinger Publications (Oakland, California). Susan Albers' approach to mindful eating is very similar to our own. There are many web resources that can support your mindfulness practice. Here, from both near and far, are a few of them. This blog contains reflections on mindfulness, psychology, and mindful living. It is an attempt to encourage all of us as we practice mindfulness and participate in mindfulness programs at Integrative Health Partners. Information about the Millennium Park Zen Meditation Group, sponsored by Integrative Health Partners. Lots of resources on mindfulness research and practice. Resources for mindfulness research and practice.